British poet, critic, and art historian Herbert Read once said, “The purpose of art education is not to make more art and better artists; instead, it is to make better people and better communities.” The Michener agrees that art and action go hand in hand in making the world a better place. Over the years, The Department of Arts Education has initiated a variety of community arts outreach programs. 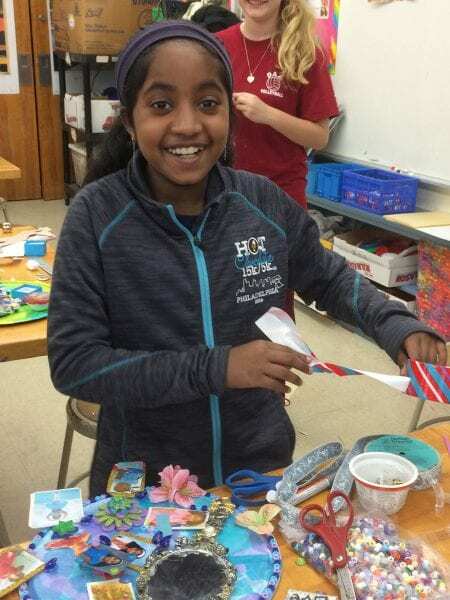 Art Action, supported by United Way, was an after-school arts program provided for families living in the Milford Square Transitional Housing Shelter in Upper Bucks County. The program ran from 2001 through 2006. Art in My World is an arts outreach collaboration benefiting Special Populations preschool students attending public school in Ewing Township, New Jersey. Students are enthralled by a monthly art lesson at their home school, integrating the Michener collection with sensory arts experiences in a variety of media that enrich and inspire. Art in My World is generously sponsored by an anonymous donor, with additional support from Ewing Public Education Foundation. Art Reach, supported by the Foundations Community Partnership, reached students in the Palisades School District with a storyteller and poetry artist-in-residence who worked with students while writing poetry, creating handmade books, and building leadership and identity skills. The program ran from 2007 through 2011. Breaking Boundaries was a teen program in lower Bucks County, focused on citizenship, leadership, the arts, and journal writing as means of self-fulfillment and creative expression. The program ran during the summer of 2008. Crossing Boundaries is a collaboration of several diverse communities of learners from Bucks County and Philadelphia. Student artists create identity mixed media works that are displayed in our Education Gallery in the spring of each year. Students and families from participating communities gather for a collaboration and Museum experience at the opening reception. The creative process provides students with the opportunity to explore the enduring questions “Who Am I? Where do I come from? Where am I going? What will I do when I get there?” Crossing Boundaries has been funded by Foundations Community Partnership, Art Serve, and most recently, the Leff Family Foundation. Crossing Boundaries was implemented in 2014, and continues to be a successful Art Action program. Scholarships for art classes and summer camps are available through the generous support of The Robert V. Nesi Education Award, The Michener Art Museum Volunteer Scholarship for Art Education Endowment, The Holly Berry Huynh Memorial Scholarship Endowment, the Doris Weiss Education Gallery Endowment, and the support of individual donors. Scholarships are good for one year pending availability of sufficient funds; every scholarship also includes a one-year family membership to the museum. And more: The Department of Arts Education hosts several community service and community awareness programs, including the Martin Luther King, Jr., Day of Service and Art, the annual Gift of Giving Education Gallery exhibition, and community T-shirt painting days. The Museum is currently working to expand these programs throughout the region. Art Action at the Michener keeps art at the heart of education.